The Chadian head of the syndicate, Abdoulaye Mohamoud Ibrahim, and eight accomplices, including his wife, son and daughter-in-law, were arrested on Nov. 1 after a two-year investigation assisted by Interpol and French law enforcement, Gabon’s national parks agency said. The ring’s “moneyman” was arrested three weeks later. The arrests were not immediately announced because the investigation was continuing and suspects would have gone “underground” if there had been publicity, the parks service director, Lee White, said in an email to The Associated Press. He said the suspects could be imprisoned for at least 10 years if convicted on organized crime charges. Gabon has Africa’s biggest population of forest elephants, which are harder to monitor and count than savannah elephants because they live in dense vegetation. 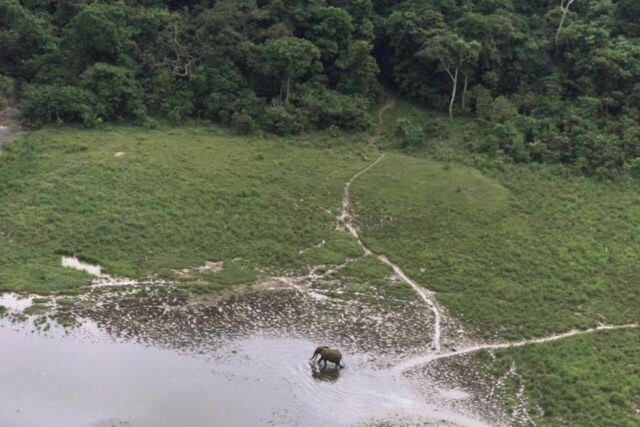 However, a Duke University study released a year ago revealed the toll of poaching, concluding that the elephant population in Minkébé National Park in northeast Gabon had dropped by about 80 percent, or more than 25,000 elephants, between 2004 and 2014. Well-protected elephant populations are recovering in some parks in Gabon, including along the Atlantic coast, according to White. Gabon has deployed the military in some areas to protect wildlife.